Pretzel Logic's Market Charts and Analysis: SPX and INDU Updates: It's Painfully Obvious What's Going to Happen Next... or is it? SPX and INDU Updates: It's Painfully Obvious What's Going to Happen Next... or is it? The very short-term charts are still a mess. Some personalities feel that an analyst should be able to have a strong opinion on the market at all times -- unfortunately, out here in the real world, that's simply not realistic or possible. Sometimes I have a strong opinion, other times the market dictates a "wait and see" approach. Personalities who require a high degree of certainty and security are probably not cut out for trading, since the market is an oft-ambiguous place. If you ask your broker, they will most likely tell you that they "don't try to time the market" so even the majority of brokers are afraid of trying to sort through the potentials. It's not an easy gig. Accordingly, I'm going to discuss what I feel reasonably confident in, and what currently appears ambiguous. 1. 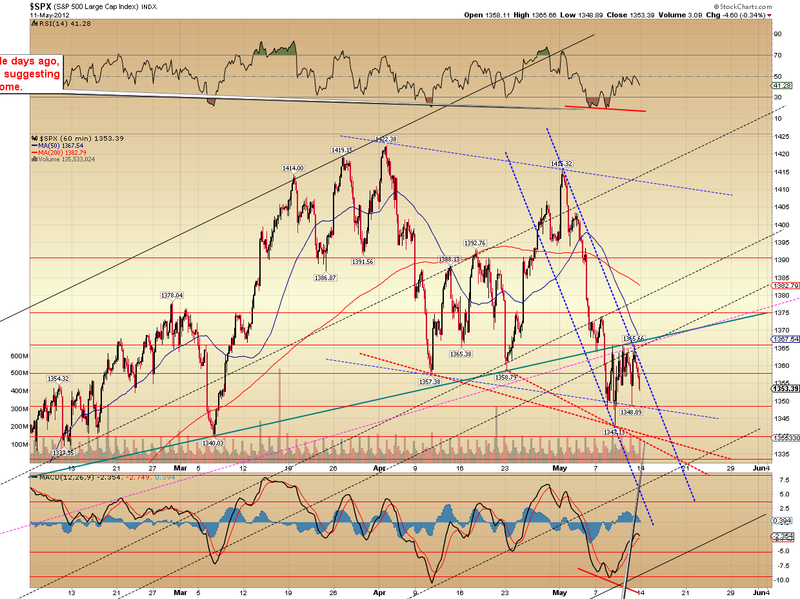 The market will make a new low beneath 1343. 2. 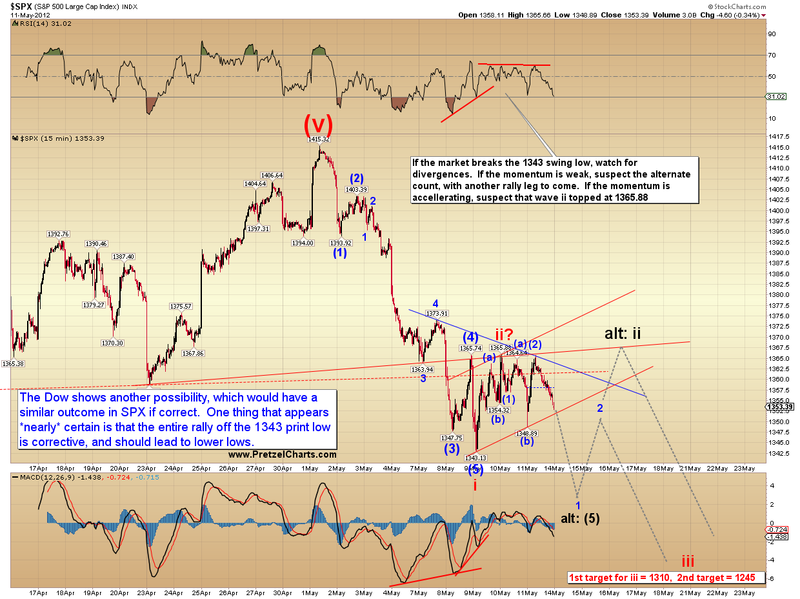 Is the corrective rally from 1343 a fourth wave at low degree -- or actually the second wave at higher degree? It appears to be a fourth wave, but that's not as clear-cut as some would like to make it. Very muted second waves at this degree have been known to occur in extremely weak markets; examine the 2011 mini-crash (below) for a recent case-study. Before the open on Friday, I discussed the strong potential for a gap open on Monday, and the short-term counts seem to indicate this opening gap will indeed come to pass. The present challenge at this juncture, which I've alluded to in the past, is that fourth waves will often string together several complete fractals to make up a larger fractal. The rally from 1347 to 1365 was a complete a-b-c fractal, which is what led me to believe at the beginning of last week that there would be new lows coming beneath the 1347 print low. This happened, of course, and yet because of this tendency of fourth waves, I cannot be absolutely certain that the 1343 low was not still part of the fourth wave. Further, I simply can't be certain whether the recent bounce was red wave ii or a continuation of blue (4). It would be very weak for a second wave -- but again, see 2011 for examples of why that's not impossible. On the Dow Jones Industrials, it counts passably-well as blue (4) (see 2nd chart). At times like this, we'll simply have to play it by ear as it unfolds. Despite the aggressiveness of the count below, and the fact that it's not "obviously the right count," I am leaning ever so slightly toward this interpretation. When everyone's on one side of the counts and market, I say: bet the other way. The Dow counts well enough as a running triangle, but the e-wave looks too impulsive. The same potential ugly wave ii exists here as well. On this chart I've labeled the aforementioned fourth wave as the preferred count, for contrast. The incredibly bearish potential which seems to have been ignored by most is the possibility that this whole decline has been nothing but a nest of 1's and 2's. I've illustrated this on the RUT below. There has been absolutely nothing to allow this count to be ruled out -- and if this is what's occuring, then the market could decline relentlessly if support fails, so be careful out there. Since the potential wave counts are ambiguous at the moment, I've prepared a simple chart of support and resistance. Sometimes these can be useful until the count clarifies. 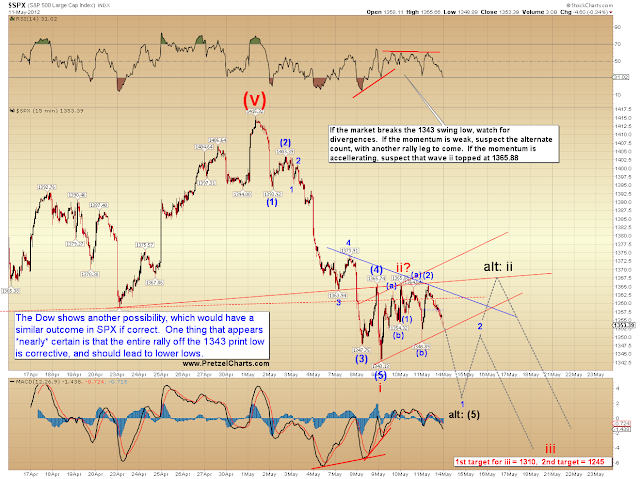 The potential support at 1340 does lead one to believe that the wave (5) count could be the correct interpretation. It bothers me that this count is almost too obvious, however. When a support zone is that obvious, many traders front-run -- so when the market finally gets there, there may not nearly as much support as everyone thought there would be, since many buyers jumped in early. Through the years, I've seen the market set traps like this before. If we get a solid bounce near 1330-1340, great -- wave (5) it was, and enough buyers were waiting in the wings to drive a decent rally. But if we get a muted bounce there, then watch out. Because if and when the "obvious" support zones break, everybody tends to bail at once and the market tanks. In conclusion, both counts are ultimately expecting new lows below 1343. 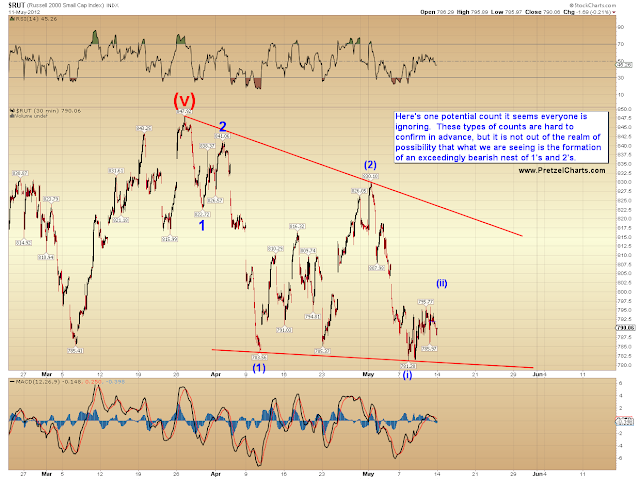 The "obvious" count is that the next low will mark wave (5) and lead to a solid bounce. I'm not 100% sold on that view, however, and I think the market is potentially in a very dangerous position. If support holds, then great: false alarm. If it doesn't, things could get ugly fast. There has been some talk of late regarding Germany possibly capitulating to a new round of printing from the ECB. If that happens, then all bets are probably off for the bearish intermediate term view (the short-term outlook still stands), since that new liquidity flood would find its way into the market, just as the last one did. 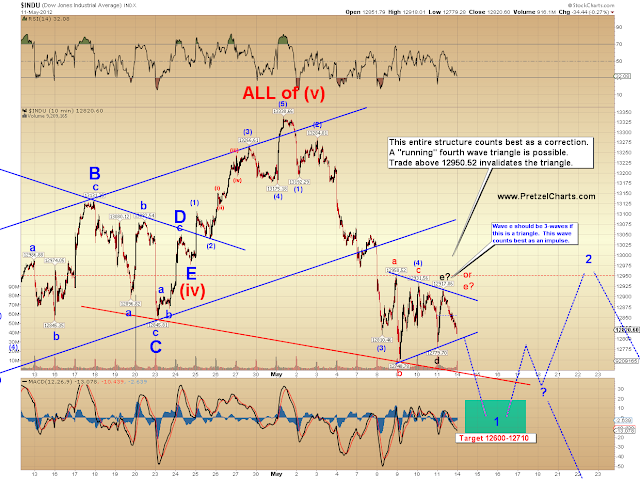 As such, I should also mention that it still remains viable from an Elliott Wave perspective that the decline from 1422 will be fully retraced after the next bottom and that an intermediate-term low is nearby... but until the market can either reclaim some key levels and/or form a more convincing bottom (or the EU announces LTRO II), I'm not giving much air-time to that potential. I'm sorry that my certainty -- beyond expecting new lows -- is limited at the moment, but to pretend otherwise would be intellectually dishonest. We're simply going to have to watch how it develops over the next few sessions to gain further clarity. Trade safe. Can you recommend a good reference on classical TA? Thanks for clarifying how unclear everything is :) ECB will need to print at least another trillion Eur soon, which will be viewed as liquidity first and irresponsible second. Yes, that's what I was getting at with watching for divergences in momentum. There has been some talk of late regarding Germany possibly capitulating to a new round of printing from the ECB. 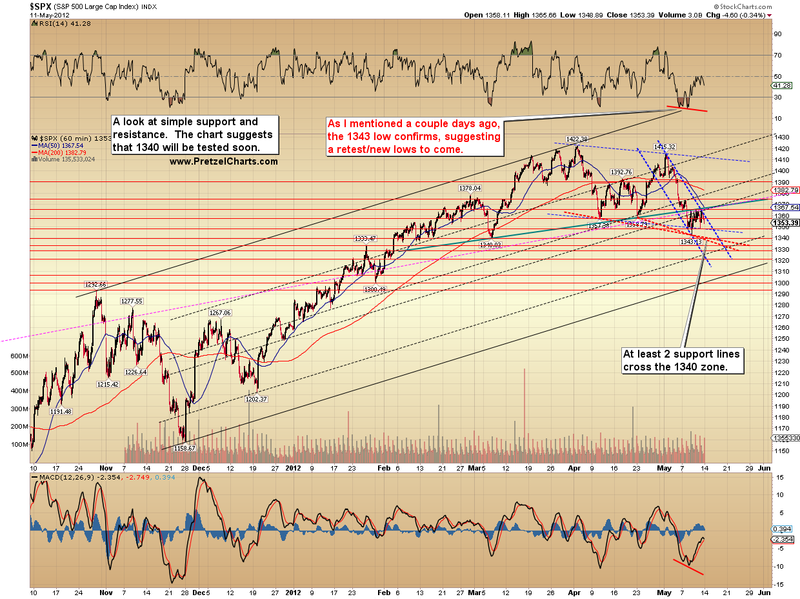 If that happens, then all bets are probably off for the bearish intermediate term view. As such, I should also mention that it still remains viable that the decline from 1422 will be fully retraced and that an intermediate-term low is nearby -- but until the market can reclaim some key levels, or form a more convincing bottom (or the EU announces LTRO II) I'm not giving much air-time to that potential. btw, per my warning of a possible trap on Friday, currently it looks like we're going to get a gap down. After looking at a few charts during the weekend, I also suggested (before the futures were open) that 1340 would be tested "as soon as Monday." Today could get interesting. eur/usd has either built a very very bearish nest of 1's and 2's and is going to drop like a rock all night, or it's an ending diagonal nearing completion. Should know one way or the other fairly soon. what did you say, refresh my memory? Again I stand by the call again PL - that we will make a potential low this week ,, and see a great powerful reversal to the upside sometimes this week around mid May. So from now on it should be great to load the next good dip ,, but the question remains ,, how low will we go on this next dip ? It could take us to 1330 imo and potentially lower - but 1330 seems like a good target , even 1340 might be good. But I think for this week bulls will make a reversal to the upside , lets see. Why one has to get good in doing own research. bull v bear trap...I started out with the right conclusion early in the day (bull trap), then was overwhelmed by the hinky behavior of the market and went with bear (my nervous tick was coming back)....I know that it's way early in the o/n to draw a conclusion, but it isn't looking too good for a bullish outcome if these lows hold. My previously anticipated Monday morning was a gap up, then the decline would begin. a mkrt in motion will stay in that motion until acted upon. behavior up to now has been to draw bulls in and tank it at EOD, Friday was the best example I have seen, it dropped like a stone. Looked like it was goin to go higher, right? Smart money using up moves to retreat from the mrkt. Sell the rallies, lower lows, lower highs, etc. stuff. as said for weeks tgt ultimately 1280 to 1320. I am still telling myself: "sell at the open, sell at the open Oh God sell at the open." I am just cautious after getting smacked around while still learning and betting against an uptrend over the past 5 months. Ive gotten a hell of an education though. We shall see. Will be watching closely for a deeper RSI and MACD. Europe is getting beaten but it is still many hours until US opens. Not quite sure what you mean here, do you mean to short at the opening or cover shorts at the opening? If you shorted at the opening on Friday you would have been stopped out. you would have been stopped out. And IT correct. . .
Yeah covering at the open today or mid morning if the bearishness wears off expecting a bounce. I have some put options I purchased last week. If eur/usd can overtake 1.28850, I think it will have a good shot at filling the gap at 1.29140. If that happens, it should be a good selling op. Thanks for last week's tgt! I should not close up position this morning and now is kicking myself for miss out the big drop. If eur/usd *can't* overtake that zone, it could be in really big trouble -- as I said earlier, it may be a nest of 1's and 2's. Always been less-than-impressed by their subscription service. You guys think I should send this article to MV? I can leave out one random article each week. Dunno if this one's any good. It's good...it's just that Friday *really* set the bar high...Hemingway on a really good day...we're still waiting for Friday's action to conclude (at least for us less learned)...this morning's opening RTH will be the tell. I'd hold it back. 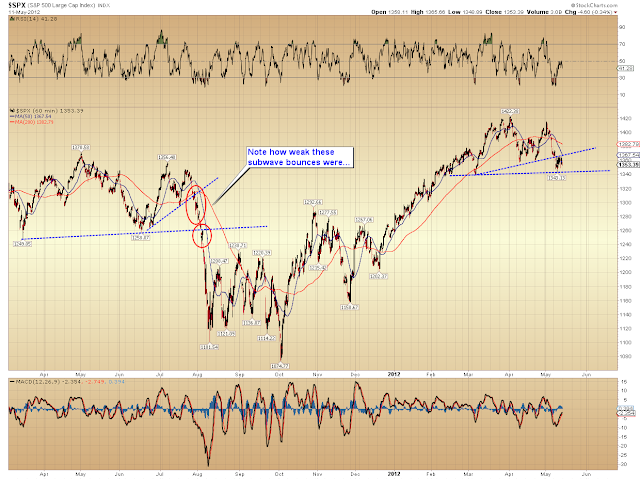 SPX Looks like pattern of last years will not repeat again. AUDUSD mounth not look good to bulls. Gold update short and Medium term. I agree with Nostradumass. I think it is an excellent article for EW guys who do their own EW counting and analysis but it may have too many possibilities for general readers. I would suggest to hold it back also. I suggest posting on Minny the first part along with the first chart, stopping there. Oh well, didn't see your post either. Well, the general population is just going to have to deal with the fact that things aren't always crystal clear. I'd like to say 'gettin busy' but I was actually eating breakfast. lol Beautiful mornin' in the northeast (except for the bulls, altho they are outstanding in their field they had a restless night). She keeps on backtesting the 1340 es level. Span and Italy government bond yields increase dramatically. Follow-up on Squid's buy rec. of AIG. got a doji on the 120, prolly headed for reset at 1343 area. should be a final drop possible (at opening? ), to the 1332 es area or thereabouts. at that point we can determine if we go lower IT, I get a mini-crash tgt of 1325 es. my LT tgt for this move down is 1280 to 1320 $SPX. once there we can determine if this is only an EW4 retrace with a final up move to come or the start of something more ominous. bullish opening to reset to 43-4? so i think, but this corrective stuff seems to morph constantly as PL and Katzo seem to say. luckily, right before it started falling, i got out, didn't want to go to sleep long as it wasn't looking strong. wish i had switched to puts, would really be smiling right now. how low do you think spx going this am before the c bounce? i'm thinking the 38 area in cash and 43.5 in ES. Sorry for asking this, but because I'm using very basic online TA charts... what do your divergences show so far? Higher prices to follow or not? Katzo7, CEL made a new 52 week low today. I'm not seeing any reason to buy yet. That was a great article. Made a lot of sense to me, dunno if that is of any value or not, LOL. Still in do nothing stance waiting for clearer oppt. This day chop, o/n drop off a cliff crap is a total PITA. FWITW, I am a believer that this mess is the EW3, 4 with a 5 to follow. I counted a full 5 waves down ST and IT from the 1/2 so this 5 wave we just entered is going to interesting. Thanks again for another great article and solid leadership of a terrific site. UVXY puts up the lunch money for today. CheeseB and fries, hold the onions. Many thanks to both of ya! Do you see my point about the supposed triangle in INDU? Wave-e doesn't look right at all. I think it's probably the same wild expanded flat 2nd wave as I've shown in SPX. I don't think it's a "real" triangle. PL, do you think CVX still looks on course for the 94 target? Thanks Katzo7. I am holding off until MACD breaks zero. When that happens, I plan to hold it long term in my roth. VIX is past 21 for a change. It sure took a dive at the opening (along with gold itself). Nice move up, though! I've been playing put options on DUST. Better way to play IMHO. Bought some 55 Jun puts just after the open and am up nicely now. $RUT now at 778, I moved my H&S neckline tgt to 775, a break of that is not bullish. . .
Backtest of SPX 1343. Kiss goodbye? Bounces look REALLY weak lately. It seems as though we're all getting a little too sure of ourselves saying more liquidity always raises the markets. Just when everyone starts assuming that is hard TRUTH, it breaks. Are we there? any thoughts on how many times this is going to stay in triangle? seems like we're due for a breakdown soon. PL, great post. This has a very similar 'feel' to late last year when you had the count nailed and then the CBs jumped in and printed 2T to prop the financial system. Granted, at that point, the market had already tanked from its highs. The only thing I read in addition to this site is John Hussman's weekly comment. negative estimate in post-Depression history was on September 16, 2000." I generally agree. I think we'll be there when your cab driver tries to discuss the latest Fed move with you. Low of 1333... Nice call. When sovereign default happens, that's when the markets will deflate. Greece basically defaulted during its restructuring (100B in wealth evaporated from planet earth) and will be defaulting again soon (how much will be evaporated this go around?). Spain and Portugal are up next. Then Italy. You might throw Japan in there depending how this plays out. We are in interesting times. It is these types of financial crises that are the precursors to war. Everyone is focused on Europe (rightfully so) and isn't noticing what China is doing in the Philippines and the South China Sea - or less surprisingly - the moves Israel has made over the past thirty days (reserve call-up and "super-coalition" created in parliament) that have the stage set for conflict with Iran. Economic upheaval is the herald of social unrest and war. And unfortunately, arithmetic says that further default/deflation is a certainty. When the market acknowledges this certainty is anyone's guess. Great post PL. I'll note that the Investors Intelligence NYSE Bullish index for last Friday was 58.6%, actually down a tad from the week before. Also Mark Hulbert posted an article last week on MarketWatch saying that the market timing newsletters he tracks are mostly in cash. And all this time I thought it was a pomegranate. 100ish is critical to CVX. If that zone can't hold, it will likely drop like a rock, and 94 is very do-able. ST count - i'm not even at home -i don't know why i'm so generous?!? Chinese curse: "May you live in interesting times." Looks to be headed for a retest of the December lows at $148, if not lower. Could even drop to the Sept-Dec channel bottom in the mid-130s. Is Disqus flaking out on e-mail updates for other people too?? For the RUTrs: Small-caps are hugging the trendline from Apr to May lows that Pretzel has drawn. Three times it's tried to penetrate that line and each time it comes back. Am on the lookout for divergences though before commiting any real capitol to the trade. you've been watching too many yogurt commercials! Disqus is not emailing updates very well today. I missed seeing that run up, was busy. But this is interesting, while the mrkt is climbing my favorite indicators are still signalling a SELL. Action brought es over the 40-1 area for a back test but the candle body is stuck right there. Either they will turn around in context with mrkt action or mrkt will come down. Also not working well for me today. Then you also must be very old! WS I agree with you on that one. Bounced to the TL and is camping out. Still looking for some indicators to show a chnge from here. Hi all. I've been away since May 3. I should have told everyone that I was selling my CVX put at the close on May 3 so that everyone else could stock up on puts. Of course CVX dropped from there. Does anyone know where CVX is in the count? I haven't had a chance to look at it since I returned. Many thanks. Looks like we did the reset you were talking about earlier. Let us know if any changes to your indicators. any update on this? are your signals still short? Looks like we are going up. One other thing WS is that the $RVX has not gone down as in the past fews days. It is hangin tight with gains from today. I think that may limit much upside from here IMO. I think the tgt will be 50 to 54 es, they are not making it easy EW wise, a move down was saved and this appears to be a ABC EW4 corrective move to the 54 area, not fun to play. dead on so far as usual ! BEAR TRAP WARNING; It looks like a 21 OB close on the VIX will be north of the upper BB, especially if we get a late day flush. es hit a low of 33.25, I said 32. THis trop to es 51 looks to be weird, not a straight line and I am not even sure it will get there, seems to be failing now. 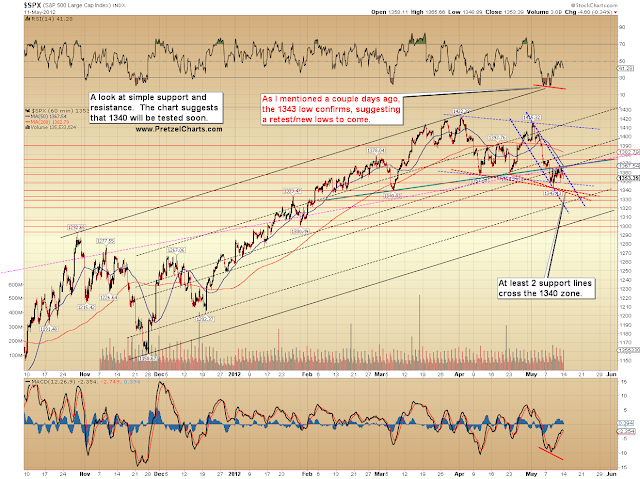 An EOD break down (I do not think this will happen) would definitely confirm a bear mrkt. you gunna break 39 or not, come mrkt tell the truth. . . I took a short at the top...right around 2:10 and got out 15 mins later at a profit. Did not see this bigger drop coming. Where do we go from here? Sideways to the d,ose? see above, head faked the hell out of me too. . .
retest done. look out below. dollar is extremely strong. . . . I'm not a spring chicken, no. Waiting for Greece to default on their English Law bonds tomorrow, I understand. I hate that I wasn't around for the triple bottom breakdown last week in SPX. Here's the p&f chart. I closed my SBUX and CVX put options today for a nice gain. All cash except for a couple VXX calls that expire Friday. Im hoping for a EW3 waterslide tomorrow but I don't think it will happen. How long do you typically hold the tvix? I bought spxu the other day and landed into a 5 to 1 reverse split. I called my broker to find out if they report these splits ahead of time and he said they can split them any time, any way with no announcement - maybe heard him wrong, but that seems to be what I remember. What's the in - out plan with this type of investment? I saw the same thing and thought the same thing! $VIX up 9.35%, but what is more interesting is this MA arrangement. It is more a question of judging the mrkt direction, to keep on the right side of the trade, look for higher highs consistent with a volativity move. I think risk assets are on the right side of the trade now. That is quite a convergence of MA's...That is interesting...Ya don't see that everyday. what is the significance and implication of this convergence? I presume a breakout in VIX is coming to a theatre near you? touched the low again AH, will it break?? I took a little TZA at the close...it looked too good to pass up...already paid for the commish...little victories. That is what I think, when you hear hoof beats think horses, not zebras. Something wicked this way comes....and I think I found some swan droppings on the front lawn. $SPX/ES is in a nice EW1 to 5 pattern down, $RUT is holding back but catching up percentage wise. Another victory day for the bears with a lower low in comparison to last week and even earlier this morning. And fear products are running higher, horses, not zebras. I found horse dropping; first I thought they were zebra but then I looked closer. i'm a little worried about the depth of this retracement after the first wave up from the bottom negating the zig zag ii potenetial if this ii is looking like a flat, the upside of the c won't be as high as I was expecting. Subject: [pretzelcharts] Re: Pretzel Logic's Market Charts and Analysis: SPX and INDU Updates: It's Painfully Obvious What's Going to Happen Next... or is it? Horse droppings have a nicer texture...I did get some new neighbors today, but I didn't know they rode. They a little loud, so I just stay out of their way. That's a cool triple point. I think one of my comments from this morning disappeared. Anyone else have any problems? My dogs went right over and gobbled up the droppings on my front lawn. Lol. I need to go shopping for a mercedes also. negative estimate in post-Depression history was on September 16, 2000. The above is CNBCs rewrite of DDs news post. See it tomorrow morning on TV. . .
"I suspect that the economy will slip into recession in May or June (yes, this month or next). If that is the case, I would also expect that we'll see a fairly rapid and abrupt acceleration in new unemployment claims in the weeks ahead (watch for upward revisions in prior data as well). Something to watch closely." If he is right, unemployment claims may start to disappoint. Note he made a good call early in the year that March and April NFP would be weak, related to leading indicators that he saw were perturbed late in 2011 (he thought due to the LTRO). I found it profitable to buy SPY puts days before these NFP releases. "If the Fed indeed steps in with an additional round of QE, a few distinctions may be helpful. First,regardless of Fed actions, and even in the past few years, the market has invariably suffered significant losses following the emergence of the 'overvalued, overbought, overbullish, rising-yields' syndrome that we presently observe. In contrast, the main window where it has not paid to 'fight the Fed,' so to speak, has been the period coming off of oversold lows... "
FWIW: If memory serves QE2 was announced at a market low and we got the "Tepper Rally", and I the market actually sold off initially when Twist was announced (likely more due to the debt ceiling and US debt rating issues) and and then rallied later when implemented, alongside the LTRO. So the QE affect can have a lag depending on market conditions. Not me. I buy American. Nah, I make my own. Less lactose. Gotta admit though, a serpent eating its tail makes more sense. I mean, whoever heard of a pomegranate of Doom? Can you even picture anyone saying, "Ooh, what a scary pomegranate of Doom"? Doesn't work. Get a big pickup, guy! Same here. Been adding TZA on dips for the past week. Added more at the close today. I have to play it by ear right now, along with everything else. lmao -- but what about The Grapes of Wrath? And its less-successful sequel: The Pinto Beans of Lust*? What on earth happened to Bob E? I agree that the economy is weakening. I have the rally as a LD - to be specific -- 1 of C (3 waves to make C of the ED/LD variety) ... after an LD you should expect a sharp 90% or even more retracement...so the late down was the 2 wave following the LD1 up. I figured that was your count. Could be. LD's usually retrace 62-86% though... 90% is a bit on the deep side, but not impossible of course. Looking forward to the list of high income stocks. Would ERF be on that list. You were talking about it last week. For CEL what time-frame are you looking to have MACD break zero? would love some feedback on what looks like a horse to me that most here are calling a zebra and wondering if i have it backwards(I have tons of respect for you guys, so realize I definately could have it backwards) ES sure seems like it was in a triangle since the 5/6 low until friday's high. since a triangle can only be in a B or 4 position, then the drop out of it last night/this am would be a 5 or C. Since, this is a complete 3 or 5 down, the next move should be up- weather that be a ii up(as in PL's alt spx count) or headed up to an all time high 5. One could definately see the possiblilty of ii being finished already in SPX, but I can't see anything like that on the ES. the only consolidation move is the triangle, and that can't be a ii. of course, as i write this, ES is dropping hard. my only explanation is that its wave 2 of the C wave of ii. A wv was the rise from this morning's low(bottom of red i), B wv was drop this afternoon for a flat, and the rise since the close should be wv 1 of C wave of red ii. this pullback should just be wv2 of that C and put us a bit higher than the high of today if all of ii is a simple small flat. of course, i'm highly doubtful that is the case and think it will end up being the first fractal of a larger wave ii that will last the rest of the week. Any thoughts on why the ES count I propose isn't very clear and thus expect the spx to count similarly albeit without a triangle in wave 4, but another more complex corrective pattern(of course the triangle is visible in the dow)? I realize I'm a newbie, but explaining how this count is incorrect to a dense schmuch like me, can possibly have the positive effect of solidifying you own counts besides the obvious hope from me that I learn something. ps can't post count of ES because I use tc2000, but the count, especially the triangle is screaming look at me. trb, thanks for pointing out $RVX. I was ignorant of its existence. I will add it to the list of things to watch over. Lat post I saw said he was galavanting around Italy... Maybe trying to stimulate the wine industry? You have good taste. Next on my list: CTS-V Wagon - a sledge hammer disguised as a grocery-getter. I'd have to see a chart and your breakdowns to give you an accurate critique. Keep in mind that not everything that "looks" like a triangle is a true Elliott Wave triangle... and in order for the EWT rules to apply (of triangle being the penultimate wave), it is critically important that it's a true EWT triangle. A great example would be when Pretzel (now famously) called the breakdown from the huge "triangle continuation pattern" back in October/November. Almost every other technician on the planet was convinced the market was going to breakout and head higher. I didn't believe it was a true triangle, based on the subwaves, volume, etc. and called for it to breakdown instead. While virtually every technical analyst on the planet is watching the bullish triangle "continuation pattern" that's been forming in the indices all month, I have stated on several occasions that I don't think it's real. After studying the price action of the last couple days, the triangle has not displayed the proper form, and the volume has not performed according to the pattern. Volume should be diminishing as the pattern forms, but has been rising instead. Doesn't mean it can't be a statistical outlier, but I am cutting my odds on the triangle from 20% to 15%. Barring some type of central bank intervention, or the significant threat of such, a break of those levels should lead the SPX down into the low 1000's. No kidding -- those V's scream. I actually bought a CTS back in 2008, but it was just a bit too small for me (I'm 6'4), so I traded it in on an STS. Well, at least a little more clarity after studying the charts today... if nothing else, some good levels to keep an eye on. Nice chart WS, I see what you mean about being camped out. Let me ask you something - does the right shoulder so to speak of this formation look a lot like an A to B wave? how about this count from the Blimpo high, 1,2 abc, abc 3,4, 1 2, of 5 with 3 of 5 starting?